Mug of thick-walled straight sides that taper towards base with applied handle. Exterior decorated with grainy matte glaze in natural/beige, beige, blue, green, yellow, and black landscape scene. 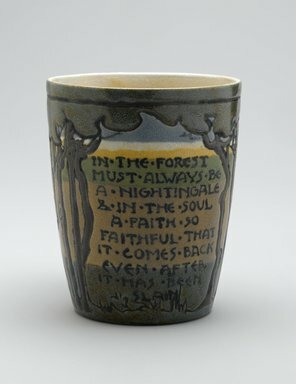 Painted in black to proper right of group of trees, “IN THE FOREST/MUST ALWAYS BE/A NIGHTINGALE/IN THE SOUL/A FAITH SO/FAITHFUL THAT/IT COMES BACK/EVEN AFTER/IT HAS BEEN/SLAIN"